A good combination of singles, twins, doubles, deluxe doubles and family rooms make up this smart bed & breakfast hotel overlooking Gynn Gardens on Blackpool's North Shore. 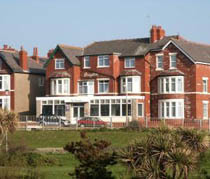 The Brayton offers 3-star-rated bed & breakfast accommodation in a quiet yet practical position just off the promenade. The town centre is just a five-minute drive away and the Gynn Square tram stop is just 200 yards on the front and runs a regular service to North Pier, the Tower, Sandcastle Waterpark and Blackpool Pleasure Beach. Guests at the Brayton will find themselves in the quieter North Shore area of resort. The 16 bedrooms on offer each have their own private bathroom and come in a good range of sizes including doubles, deluxe doubles and family rooms. The usual perks are available: LCD Freeview television, FREE wi-fi (in some rooms) and cots and cribs for children. You can also request hairdryers from reception. If you seek the thrills and spills of Blackpool you'll be pleased to learn that the hotel owns a 16-seater Mercedes mini-coach that provides a shuttle service to groups of 10 or more to the shows and attractions in and around Blackpool. There's also some special Brayton 'Pleasure Beach Weekender' offers. The breakfasts are good and are served daily. These feature locally sourced ingredients and early-start breakfasts can be arranged on request. Blackpool illuminations can be viewed from some of the hotel windows.